In a previous article, I wrote at length about the City of Toronto’s reports on the status of SmartTrack to be discussed at the October 20, 2015 meeting of the Executive Committee. Two related items also deserve comment. First up is an article in the Star by Tess Kalinowski in which she reveals that Metrolinx CEO, Bruce McCuaig, wrote to City Manager, Peter Wallace on October 6, over a week before the reports were posted on the Executive Committee Agenda. His letter said quite clearly that SmartTrack would only be an incremental upgrade of GO service, not a separate operation running on GO’s trackage. “Metrolinx and the province believe that the (city report) should reflect the scenario where SmartTrack is an incremental increase in RER (regional express rail) service, rather than an independent and parallel service that co-exists with RER,” he wrote. “The risk of creating unmet expectations is too great,” said McCuaig. The letter also suggests the city stop referring to SmartTrack as a “surface subway” since federal rail regulations would prohibit TTC-style subway trains from operating on GO tracks. The full text of the letter is not yet online, and it is notably absent from the Executive Committee agenda. 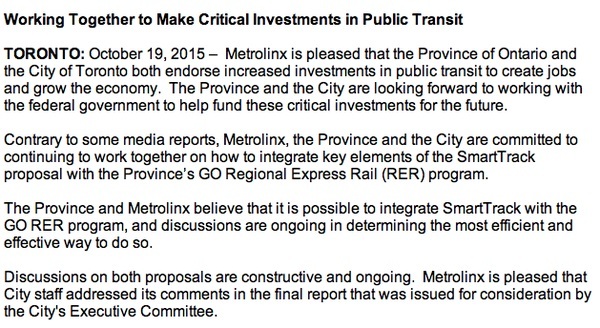 Metrolinx has issued a statement pledging its continued support for “key elements” of SmartTrack, whatever that means. Second is the appearance of an “advocacy group” called FAST (Friends and Allies of SmartTrack) which appeared to spring out of nowhere earlier this week. This is no ordinary citizens’ group plotting in someone’s kitchen how to get some new transit line built, but a well-financed group with close ties to Mayor Tory. Their website reproduces the Tory campaign colours and links to SmartTrack material from that era. Although the domain name was only registered a few days ago, on October 9, efforts to solicit support by the organization have been underway since at least April 2015 as revealed by Councillor Gord Perks from SmartTrack lobbying information. Minutes of the Toronto Financial District BIA (Business Improvement Area) meeting on April 22, 2015 show that they received presentations from Iain Dobson (a principal of the SRRA consulting firm working on SmartTrack related real estate studies, and a member of the Metrolinx Board), and from John Duffy of Strategy Corp., someone who was closely involved with Tory’s campaign and the SmartTrack proposal. The critical phrase here is “supporting transit-oriented developments”, a polite way of saying “make somebody’s land more valuable”. People do not launch $400k campaigns just because they like streetcars, for example. The comment about SmartTrack not being “eroded into local service” is particularly striking considering that if nothing else, “local” would characterize the proposed ST route and its stations by contrast to the “regional” GO/RER. Local access, particularly in Scarborough, was a major selling point of this scheme. Quite clearly, a lobbyist known to be connected with the Mayor was trying to hit up a business association to help fund a campaign aimed at getting SmartTrack built. This is a gross distortion of transit and city planning principles, and mocks the whole idea that we have professional staff, not to mention an informed public debate about alternatives. To be fair, it is not exactly unknown that private groups lobby for transit schemes, but this has the combined problem of being as blatant as possible and of touching the Mayor’s office in a way he cannot avoid. As for the FAST website, it has been a comedy of errors including a signup page that was clearly cribbed from another campaign (ironically, No Jets TO) and had all the earmarks of hasty assembly. This page has been (mostly) fixed now, but this doesn’t speak to care in their launch. The site richly deserves to be torn apart because, if nothing else, it shows that SmartTrack boosters have learned absolutely nothing since last year’s election campaign and they continue to spout the same bilge about their project after extensive criticism. This is the mark of an organization whose only goal is that its message drown out all others. Facts have nothing to do with it. Is this how we elected a mayor whose primary attribute was that his name was not “Ford”? The organization describes itself as non-profit, but don’t expect a tax receipt from any donations. There is a Public Advisory Board which includes the former legal counsel to John Tory’s mayoral campaign and others close to the Mayor. The “lead organizer” (as described by the Sun) was Tory’s campaign manager. “Much of the needed infrastructure” is, in fact, not already in place as is clear from the City’s status update and from comments by GO Transit. There may be corridors and tracks, but these are already spoken for for GO’s own services. Planned upgrades are to support GO/RER service and there will not necessarily be capacity left over for SmartTrack trains. The statement is rather like talking of a BRT network on roads that are only four lanes wide including parking. The roads do exist, but putting a BRT structure on them would be “challenging”, to be polite. As to the relative speed of construction, a great deal depends on the scope of what will be needed (that “existing infrastructure” issue again) and the degree of urgency with which any alternative project might be undertaken. I am sure that any proposal can find an analyst who will claim day 1 break even, but this depends on a very high ridership number that is not attainable with the planned service. In a few decades after all of the SmartTrack-related property developments are completed, and enough track time is available to run very frequent service, maybe. Day one? Not a chance. As for “Regional Express Rail”, this term means different things in different cities (service levels, degree of integration with other levels of transit, fare structures), and SmartTrack advocates conflate RER with SmartTrack for their convenience. That’s all very well, but it is quite clear from Duffy’s presentation that the real goal is to sell SmartTrack “as it is envisioned”. All of the issues listed above have been raised over the past year, but criticism has been sloughed off first by the campaign, later by the Mayor, as naysaying attempts to derail a vital part of the city’s future. Wrapping yourself in the flag is no way to advance an argument for billions in public transit spending. None of the “built properly” principles listed above has been seen in any of the SmartTrack advocacy to date, especially including an acknowledgement that the scheme, as proposed, might be unworkable. Would new track have to be built for SmartTrack? Yes. 90% of the corridors are already in public hands. But some new lines would be needed. In the original version of the FAQ, FAST confused “corridors” and “track”. As already mentioned, having a corridor does not necessarily mean that one has available track capacity. The statement was corrected in the version now online (above). So much for accuracy. How long would it take to build? Understanding that most of the lines are already in place, Mayor Tory’s campaign estimated SmartTrack would take 7 years. By comparison, the Relief Line is a minimum of 20 years away and would involve construction of a completely new line underneath downtown neighbourhoods. Having fixed the “corridors” and “track” problem, they persist in saying that it will be quick to build because the “lines” are already in place. Also, the statement about the construction period for the Relief Line exceeds by quite a margin the 12-15 year period cited by Toronto’s Chief Planner. The issue is with the will to undertake the project which delays its ever getting started, and could strangle funding for quick execution. Also, the original time estimates for SmartTrack ignored the need for tunneling in northwest Toronto, and the additional infrastructure needed to operate both GO/RER and ST in the same corridors. The Tory campaign estimated $8 billion cost, shared 1/3 each by city, province and federal government. Take the average cost of “overground” construction in Berlin and in London, UK. Adjust for inflation and Toronto conditions. Multiply by the proposed length of SmartTrack. No engineering. No estimation of the complexity of integration with existing lines. This is what passes for budgeting in political campaigns. Prime Minister Harper has promised $2.6 Billion for SmartTrack. Liberal Leader Justin Trudeau has also promised $2.6 Billion for SmartTrack, as well as $2 Billion for electrifying GO lines. NDP Leader Thomas Mulcair promises billions for municipal infrastructure, including transit. Premier Kathleen Wynne’s government promises to fund electrification of GO lines, a key element of SmartTrack. Harper’s promise will be little better than toilet paper in a few days, and in any event is a promise of money far down the road to pay off a debt that will be run up through a P3 scheme. Trudeau was foolishly pulled into an explicit SmartTrack commitment, while Mulcair’s money has a more general application. By the way, the NDP transit funding is about 2/3 existing money with only a top-up from new spending. All of the existing capital subsidy (from gas tax) is already spoken for in existing City/TTC capital budgets. As for the Ontario commitment, it is unclear what the actual “value” will be out of that $8b total, and Ontario intends to count whatever it spends on GO/RER and electrification as its share. Until we see an actual cost estimate for the marginal cost of adding SmartTrack on top of the GO/RER system, we will not actually know what the scheme would cost Toronto. What route would it take? Mayor Tory proposed 53 kilometres of track from Markham through centre of downtown, northwest to the Airport Corporate Centre in Mississauga. To save you doing the math, that’s about $150m/km. We have no way of knowing how this would break down between new infrastructure and rolling stock, both of which depend on the final alignment and on the service plan. There has also been no discussion of a yard and maintenance facility for all of the added SmartTrack fleet. Are there complications in building the remaining 10%? Yes. There are issues to overcome along Eglinton West in the Mount Dennis area. They require sensitivity to the residents and careful planning. This has to be the understatement of the century, but the answer shows an assumption that a route along Eglinton will happen. It is just a question of appeasing the locals rather than looking at an alternative route, something that is an integral part of current studies. This page cites the usual stats about congestion and its cost, but does not break this down by those areas and trips which SmartTrack would address and all others. That’s all very well, but what does SmartTrack do about this? Metrolinx projections indicate that the results will be quite small, much less than the benefits of a Relief Line via Don Mills to Sheppard. FAST Public Advisory Board Chair, Alvin Curling. FAST Public Advisory Board Member, Kyle Rae. Well, yes, if you live in the areas SmartTrack will serve and want to go to the central area, it’s a great line, but there are many more commuting patterns that ST does not address. As for the “infrastructure is already in place” argument, someone should take Kyle Ray aside and explain the whole “corridor/track/lines” business to him. His quote is parroting an out-of-date argument. Moreover, Queen’s Park hasn’t promised a penny beyond what they would otherwise spend on GO/RER and electrification. We do not yet know what the marginal cost of adding SmartTrack will be. From Unionville to Union Station the current commute is about 134 minutes. On the SmartTrack line: 42 minutes. Less than half the time! They don’t get out much, those SmartTrack folks. There is already a GO train that runs from Unionville to Union and it takes 41 minutes to make the trip. By the time ST opens, there will be frequent all-day, two-way service under the RER plan. Approximately 90% of SmartTrack would run along corridors that are already in public hands, so it will not displace any existing roadways. This is true as far as it goes, but oh that 10% (Eglinton West) where clearly the FAST folks think the line will still run down the middle of the street. SmartTrack will have a conservatively estimated ridership of 200,000 per day. That is the equivalent of about half the daily ridership of the existing Bloor-Danforth line. Let us assume a 15 minute headway, the value used in almost all of the city reports on the subject. If these are 10-car GO trains, that’s 8,000 passengers per hour. We can reasonably expect full trains inbound from east and west, so that’s 16k plus, say, another 4k in counterpeak travel for a total of 20k in the peak hour, or maybe 80k for the four peak hours over the day. Getting from there to 200k (or more) is a huge leap and cannot be achieved with the likely service level SmartTrack will provide. This ridership estimate was based on much more frequent service that simply is not possible in the corridor co-existing with other services. The number was, to use parliamentary language, misleading when it was cited in the election campaign, and yet it continues to be used in spite of repeated criticism that it is grossly in error. Some, yes, but not all. Much also depends on good TTC feeder services and integrated fares. It is far from clear whether this will actually happen or how much subsidy it will require. Remember that Mayor Tory wants to flat line TTC operating subsidies for 2016. SmartTrack will slash commute times for suburban passengers. Estimates indicate that riders can expect a less than 30-minute commute from Kennedy subway to Union Station. Today, that same commute takes approximately 40 minutes on the current subway network. As with the folks in Unionville, riders will have the option of using GO/RER to make the same trip in 19 minutes. SmartTrack will use clean and fast electric multiple unit vehicles (EMUs) – not diesel locomotives. Better for riders, better for the environment. SmartTrack will be a regional transportation system, delivered by Metrolinx. You might want to check with Josh Colle who thinks that this will be a TTC operation. Metrolinx, of course, knows that anything running on their tracks will be a Metrolinx show. SmartTrack will strategically link economic clusters throughout the GTA, including the Markham Employment Cluster in the east, the Airport Centre Employment Cluster in the west, and the downtown Core. More importantly, though, it will connect people to jobs. Again, will someone please explain why Toronto will pay to make employment clusters in Markham and Mississauga more accessible without a financial contribution by these municipalities. While we’re on the subject of contributions, will Tax Increment Financing recoup the benefits to landowners in these municipalities from the SmartTrack investment? By now, you may have noticed that beyond promises of money from Ottawa and Queen’s Park, there is no mention of how Toronto will finance its share of the project. The magic of Tax Increment Financing, quite evident during the mayoral campaign, has vanished into the mist. This entry was posted in GO Transit, SmartTrack. Bookmark the permalink. The conceptual level assumption was that up to half of the people would be accessing points east of Bay St and seek other routes. There exists a conceptual options to provide more peak capacity and intermediate destinations of varying complexity, which would be investigated further if/when the project is funded and there is a clearer picture of what supporting transit would be available (DRL, LRT, etc). And dare I ask what happens when the inevitable shutdown for maintenance arrives? I would dare to say it wouldn’t be covered in GO’s on-time guarantee. What happens when they go to double berthing to maximize throughput of trains? Would they not want to be able to bring trains into each track from both directions? From what I have seen the UPX trains stops on the westbound entrance to track one. The platform north of Track 1 is only long enough to support a single train. “Double berthing” focuses on the middle and southern platforms. Tracks 1 to 4 would be single berth plus UPX to the west on Track 1. Tracks 5 to 10 would be double berths, Tracks 11 to 13 would be single berths, Tracks 14 to 16 would be double berths with Track 15 removed for a new 650m platform. What are the chances of a double stack freight running up the Weston sub from the USRC to the Halton Sub with an electric locomotive? Yes, the working solution for the western tunnel of the WTD is that there are swing arms attached to the side of the tunnel, if/when DSF needs to use the tunnel, it can be de-electrified and the wires swung clear of the tracks. It was mainly an example of how recently the full impacts of expanding freight requirements and clarified electrification requirements have crystalized into a solid number. Platform edge doors are not the solution. Metrolinx is looking at all possible solutions at Union. This included basically scrapping everything existing and rebuilding new wider platforms on fewer tracks. This one falls low on the list however, because it can’t take the system volume of trains and has a huge price tag. If might eventually be done if the pressure is let off by building Spadina/Don Stations, but not in the next decade or so. That’s the latest that I’ve heard as well. Thanks for the feedback. Do you know if they are going to run the Lakeshore service on the single berth platforms and keep the through routed base service and will they run the trains in a sequence that minimizes the need to use those engineering marvels and operational nightmares of double slip switch ladder tracks? Everything is quite fluid right now, and it all depends on what gets funded and when. There is extensive simulation modelling going on to optimize service under regular conditions as well as what to do in recovery conditions. Generally, it is well known that using the ladder tracks is horrid, so most permutations avoid them wherever possible. This generally results in dedicated platforms and dedicated approach routes (some shared for flexibility).